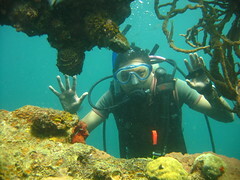 Coron’s main draw for scuba divers is the fleet of World War II Japanese shipwrecks sunk around the Calamian Islands by US bombers in September, 1944. Around an hour by boat (give or take a few minutes depending on which wreck) from Coron proper, the wrecks sit on various reefs — or have become reefs by themselves — in relatively shallow water, some as deep as forty meters and one as shallow as the surface itself. 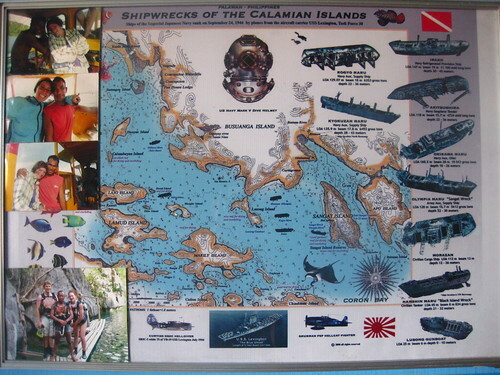 We only had time for two dives on January 30th, 2011; “Wizard,” our divemaster at Rocksteady Dive Center, suggested we do two relatively easy, shallow wrecks: East Tangat Gunboat and Morazan. The trip to the dive boat was an adventure itself as we rode on the flatbed of the same cargo tricycle that had delivered our diving gear to port. The dive boat, “Three Little Birds,” (there was a was a long and involved story behind this name which I now forget) was a luxuriously large banca, brightly colored with the distinct red and gold of the German flag (after the dive center management’s nationality) and appointed with tank racks, generous seating, space for dive gear, steps to the water, a full size outhouse, and a Hyundai steering wheel. 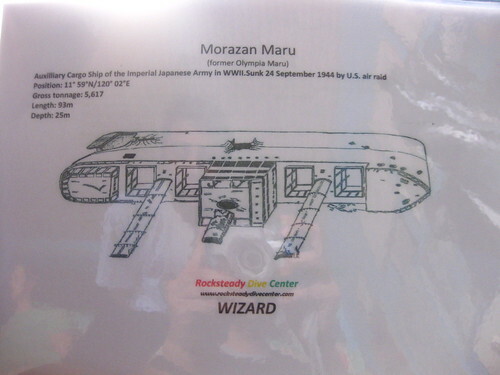 Originally Tamakaze Maru, the nomenclature for this particular wreck site might be a bit confusing, as it is called East Tangat but is located beside Sangat Island. 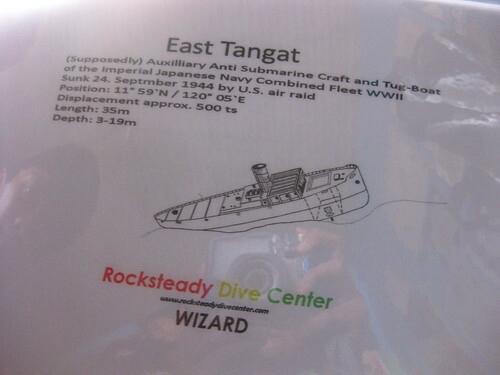 As Wizard explained it, “tangat” in some local dialects means “gap” or “channel,” and the wreck sits in the channel between Sangat and Busuanga islands. 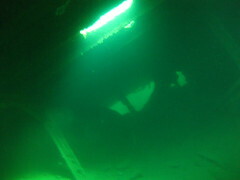 A “sub hunter” gunboat, this wreck is notable for the periscope under its hull used to scan underwater for enemy submarines. 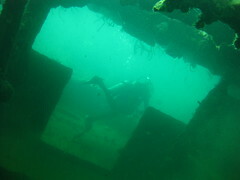 The gunboat sits on a slope, shallowest at 3m and extending down to 19m, resting at an angle with its cargo hold and engine room wide open for diver entry, and the bow readily visible from the surface. 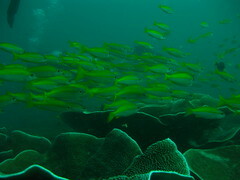 The wreck teems with life: a cloud of chromises and damselfish greeted us on entry, a small nudibranch undulated along the deck near a spotted sea slug, moray eels peeked out from holes in the hull, and ethereal juvenile ghost pipe fish slithered through the thick coral crusting the gunboat. 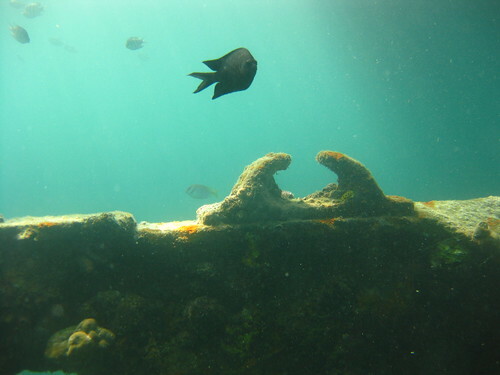 Above and below the gunboat, its towers, cannons, and sub-hunting periscope formed hollow cylindrical mini-reefs of their own, covered with coral and anemones inside and out. 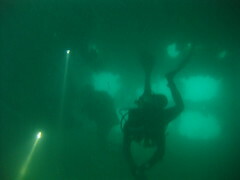 An old T-shaped entryway and multiple openings in the hull from previous salvaging blasts afforded entry to cargo hold and engine room spaces big enough for a family of divers to fit inside the boat, with sunlight streaming into the space. 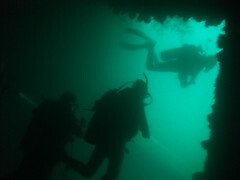 The interior was relatively unpopulated with sea life, and rather silty, such that divers’ movements kicked up debris and reduced visibility. 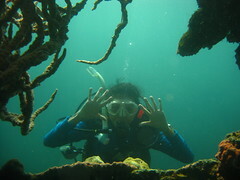 Through the coral-crusted holes of old chocks we took goofy photos of each other making underwater jazz hands. 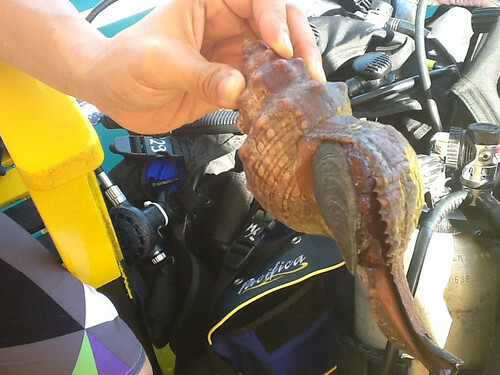 On the way up, Mom found a small conch, the shell still oozing with its snail-like tenant. It was still alive, so we threw it back into the water. Mistaken in the past for the Olympia Maru, it’s now known that Olympia is another nearby wreck, and this ship was the Morazan Maru, a captured English/Central American freighter pressed into Japanese service and sunk here, on the opposite side of Sangat Island from the East Tangat Gunboat. 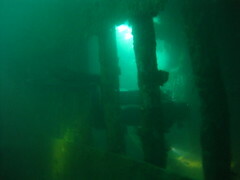 Morazan is a much larger wreck, and rests on her starboard side in about 25m of water. 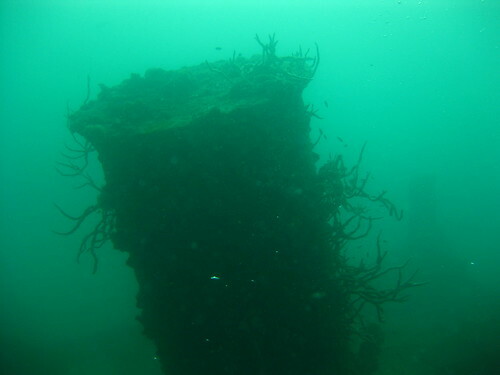 There was a bit of a current at the surface, but the water calmed as we descended the buoy line to the wreck. 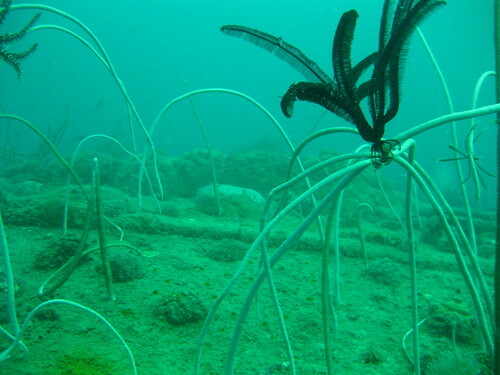 Part of the coral-encrusted hull appeared to have been colonized by an inert species of marine worm. 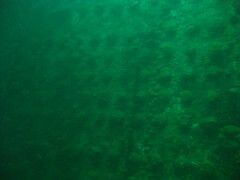 Elsewhere on the wreck, the hull gaped with large entry holes, damage from war and later salvage operations. 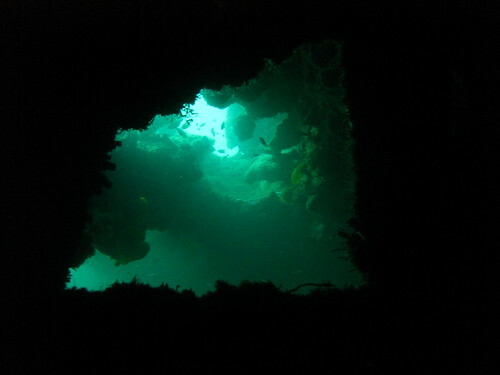 Inside, the wreck had vast, empty spaces for cargo — quite dark, of course, so a light was necessary, though occasional beams of light filtered dramatically into the cargo holds from cracks in the hull or old portholes. 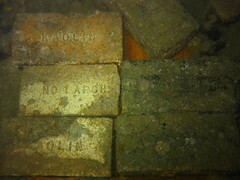 We were able to traverse almost the entire length of the wreck, passing at one point through the engine room and coal furnace, where kaolinite insulation bricks still bore their manufacturer engravings. 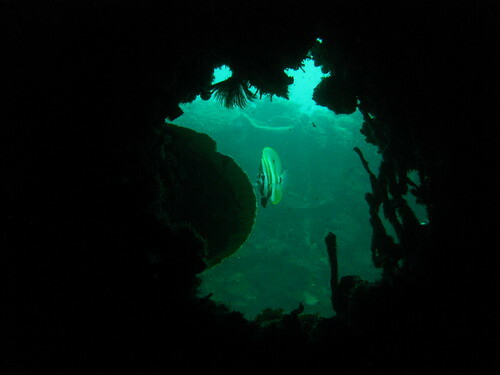 Along the walls, small giant clams fed from the silty water, while batfish peeked at us through chucks and coral-lined portholes. 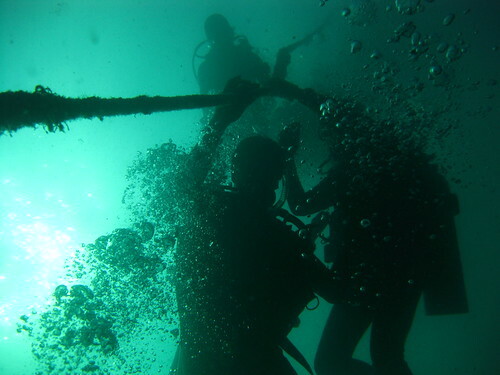 At the rear of the wreck, we turned a corner and headed forward through the ship’s #3 propeller shaft, now empty and navigable, back to a wide mid-deck salvage hole, through which we exited and returned to the ascent line. 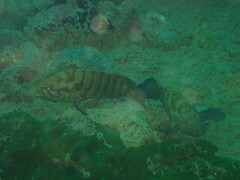 Along the way, I saw a school of banana wrasses swimming along the outer hull of the overturned wreck, and a pair of groupers resting near our ascent point. 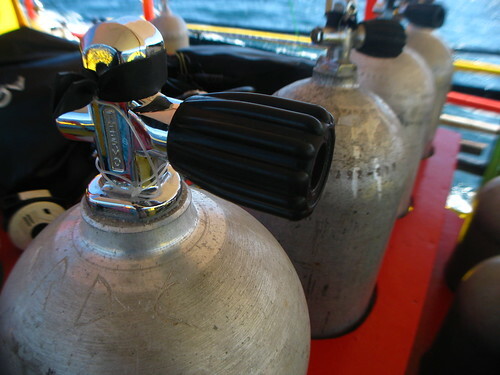 My computer, a very conservative Suunto, demanded a five minute decompression stop — difficult, since my air was almost down to zero, necessitating a few inhalations from the divemaster’s secondary. The surface current wasn’t helping matters. Still, I completed the deco stop and returned to my primary regulator with just enough air to get to the surface. 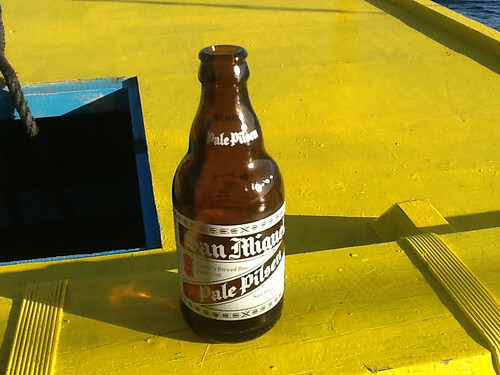 A final note: they served San Miguel Beer on the boat post-dive; perfect for the return trip. 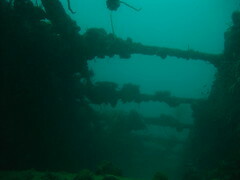 Full Coron Wreck Diving photoset here.